The JusticeMakers Program searches for criminal defenders and legal professionals with innovative strategies to promote criminal justice at national and local levels. Having local advocates run projects on the ground has been a truly effective method of reaching out and supporting those in need. Applicants are required to submit a detailed proposal of their idea. Those with the most innovative, sustainable, and efficient projects will receive a US$15,000 Fellowship to implement their work as well as support from the IBJ global network. 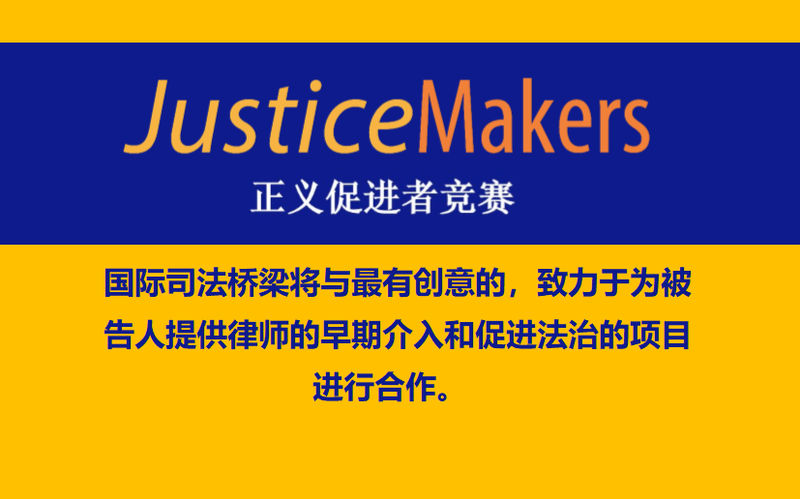 The 2018 “Justice For All” Asia JusticeMakers Competition is now open. To apply, complete the below form in English or Chinese and send it to justicemakers@ibj.org by Monday 15th April 2018. Competitive projects will work to remove barriers to justice for innocent accused, improve access to justice for juvenile defendants, or tackle gender discrimination in the criminal justice system. Encourage legal professionals that you know to apply. Circulate our Call for Applications through your email list to your members. Forward our Call for Applications with other networks of NGOs/CSOs or lawyers who may be interested in our competition. If you are interested in becoming an IBJ Promotional Partner, email justicemakers@ibj.org to get access to the competition marketing material. Furthermore, please send us your organization’s logo so that we can post it on our website. If you have any further questions about the competition, please take a look at our FAQ page or contact the JusticeMakers team at justicemakers@ibj.org.